Bar stools can be a great space-saving solution, as well as looking good in your kitchen or kitchen-diner. The taller, usually more slender bar stool can look less clunky than your average chair, and we all know how utilising vertical space can make a room feel bigger, so for us, they’re a real design win. But if there’s one take-away, it would be to not get them confused with counter stools. Counter stools are generally around 24 inches from the floor, while bar stools tend to sit a little higher at 30 inches or above. To be sure, measure from your floor to the highest point of your breakfast bar (or counter, if that is what you’re after) to figure out what height your stools should be. Luckily, though, most of the bar stools on our list give a little bit of wiggle room, offering adjustable height with gas lift levers or swivelling seats. This is not only good news if you have a bespoke breakfast bar that sits at a non-standard height, but also if you have small people in your household who would benefit from having a leg up. Read on for our pick of the best bar stools. The origami-style back and gently curved seat of Lakeland’s Cobain bar stool give it a real high-end look, especially in our personal favourite soft grey shade, but the inclusion of faux leather rather than real keeps things affordable. An anti-scratch base means that it’ll stay looking new even if subjected to the odd bit of over-enthusiastic vacuuming, and owners say that the padding makes for a comfortable sit, too. For looks, comfort, and the fantastic price, these get our first place spot as the best bar stools to buy right now. The Lem stool is an award-winning design icon, so it’s clearly good company to keep if you’re after a lust-worthy modern kitchen. The curved-edge, one-piece frame extends downwards to double up as a footrest, while the undulating seat gives natural shaping and support for a comfortable sit. Of course, it’s incredibly expensive, but it’s an investment piece for sure, and a cleverly designed and timeless one at that. Anyone who’s had the unhappy task of dragging chairs around the house to boost capacity at dinner time will rejoice at the design of the Kitson – its unique doughnut-shaped faux leather seat not only aims to be outrageously comfortable, it also offers a well-placed hand hole for moving and carrying. 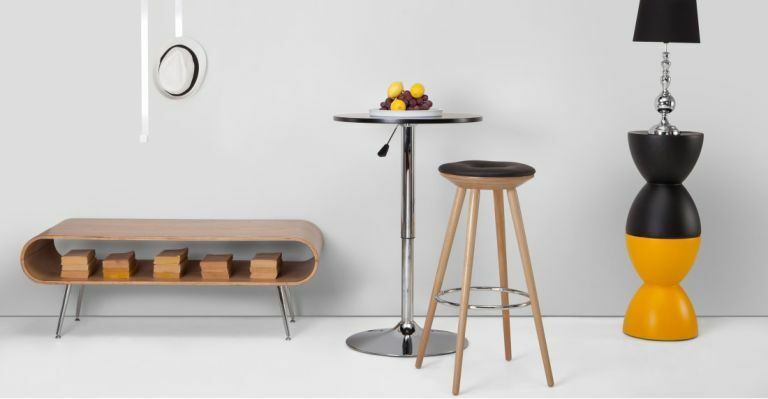 These stools aren’t just useful, though; they also look great, with slim tapered legs and a minimal design that would fit in well with both retro and modern kitchen schemes. Another fabulous offering from Lakeland Furniture, the Cuban bar stool (not to be confused with the Cobain) is agreed all round by those who own it to be comfortable, easy to assemble, and very chic. It has easily the best colour choice out of any model on our list, with shades ranging from cream and grey to kelly green and fiery orange, so it’ll fit any scheme you can throw at it, but that’s tied for top feature with its excellent adjustability. With an optimally angled back, footrest, 360 swivel and height adjustment, it’s a great all-rounder. Looking for a distinctive piece to add a touch of personality to your kitchen-diner? These reproduction Toledo stools are just that. Playing off the original early-20th-century design intended for schools and workshops, these repros have a slightly mad Steampunk feel to them, all exposed nuts and bolts on a copper-finish steel frame. But while that design has become a bit of an icon, it’s also about the practicality: the height-adjustable swivel seat means they can be used at different heights of table, very useful for unexpected guests. If you’re after barstools for an industrial interior, rustic barn conversion, or even the deck or patio, these stools are sure to look the part. Made of durable steel with a gorgeous gunmetal-coloured gloss powder coat finish, they’re all set up to last for years, even when exposed to the elements. Unlike many of the more pared-back industrial designs on the market, these stools kindly come with rubber feet to protect floors from scratching and avoid that awful sound (you know the one). Plus, under £100 RRP for a set of four stools is quite phenomenal. Ikea’s Bernhard stool might look a little stark on first glance, but in that minimal design lies a surprisingly comfortable and flexible sitting experience, if its many devotees are to be believed. The slim, curved seat is covered in a single piece of leather, meaning crumbs have nowhere to hide, and therefore making the Bernhard an excellent option for family breakfast bars. For real leather, too, it’s an absolute bargain. The best bar stools for families with children on our list. Yet another design icon, the Bertoia Barstool is a stunning and foolproof way to add a dose of mid-century cool to your dining space. The classic wire grid design is less obstructive than a solid seat, giving the illusion of more space in a small kitchen, and its slender legs have a small footprint. Reviewers have commented favourably on how comfortable they are, but some noted that there’s a learning curve to getting in and out of them in a dignified manner. If you’re happy to put the practice in, we think these would make a fantastic design-led addition to any modern kitchen. Plus, with the added benefit of a slightly higher back than most bar stools, these are the best bar stools for comfort that we have come across. Thinking of changing your dining furniture? Check out this guide to the best dining tables by our friends at TheRadar.